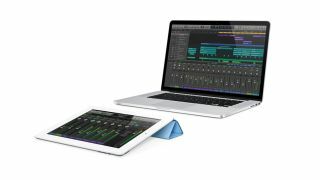 It should come as no surprise that Apple's Logic Remote app running on Apple's iPad makes for the perfect touchscreen controller for Apple's Logic Pro X DAW running on an Apple Mac. For more on iOS music apps, get your hands on Future Music 291, which is on sale now. Step 1: The icon in the top left-hand corner of Logic Remote toggles between the various control groups it can command. Smart Control and Keyboard mirrors the Smart Controls allocated to any instrument within Logic Pro X. Over Wi-Fi this means you can drive sound editing changes to key parameters and, if you've enabled Latch or Touch Automation modes, record moving, dynamic parameter changes to a project. You can swap the keyboard over to drum pads or a fret-board too. Step 2: The second option from the top left-hand corner icon launches the Mixer. As Logic Pro's full mixer occupies a lot of screen space, Logic Remote partitions its controls, with different groups of parameters accessible via buttons just to the left of the Master Output fader on the right-hand side. The top of these includes I/O routing, so to swap one instrument for another, tap and hold on an assigned instrument, then pick Choose Plug-In to browse alternatives. Step 3: The second Mixer button opens MIDI FX slots, and these can be initiated here if none are already assigned. Clicking Open Plug-In on a MIDI effect launches its parameters, which can all be configured via the app. The Arpeggiator, for instance, provides a comprehensive control set, listing parameters to facilitate close control of arpeggiation settings in more depth than the desktop GUI allows. You can, of course, hear changes in real time as your sequence plays back. Step 4: The same approach is adopted for audio effects too; click on any effect you want to customise, then control its parameters via mini drop-down menus and sliders. As with Smart Controls for synth settings, if you want to write parameter changes to a mix as it plays back, select an Automation mode from the main Mixer page before opening the plugin. The Channel EQ is even more intuitive, directly mirroring the desktop version for easy tone adjustment. Step 5: To access Logic's huge library of sounds and settings, click the Library icon. This allows you to substitute an existing sound for any other, or set up a new sound from scratch. Elsewhere along the top panel, you can jump between channels using the arrow keys around the Bar counter, enable/disable Cycle mode and the Metronome, access key parameter settings and options via the Spanner icon, or enable Help, which tags all functions, to help you learn. Step 6: Lastly, you can configure and operate a project's Key Commands. These display as a series of pads, with the Transport bar provided along the bottom strip. Above these, three pages of key commands are shown, letting you Save, Undo, Redo, Cut, Copy, Paste, Zoom In/Out, Punch In/Out, Solo, Tap Tempo, and much more besides. Whether you're driving a project onstage or working in the studio, Logic Remote has a lot of functionality to offer.